Stephanie Lynn "Stevie" Nicks (born May 26, 1948) is an American singer-songwriter who is often regarded as the Queen of Rock n' Roll. Nicks is best known for her work as the front-woman of Fleetwood Mac and for her chart-topping solo career. She is known for her distinctive voice, mystical visual style, and symbolic lyrics. Collectively, her work both as a member of Fleetwood Mac and as a solo artist has produced over 40 top-50 hits and sold over 140 million records, making her one of the best selling music acts of all time with Fleetwood Mac. Her influence in fashion, music and musical performance is widely acknowledged; and as such, she has been named one of music's top 55 "Greatest Songwriters of All Time", and as one of the world's top "100 Greatest Singers of All Time" by Rolling Stone. As a member of Fleetwood Mac, she was inducted into the Rock and Roll Hall of Fame in 1998. She has garnered eight Grammy Award nominations and two American Music Award nominations as a solo artist. She has won numerous awards with Fleetwood Mac, including a Grammy Award and five Grammy Award nominations. In 1981, while remaining a member of Fleetwood Mac, Nicks began her solo career, releasing the album Bella Donna, which topped the Billboard album charts and reached platinum status less than three months after its release, and has since been certified quadruple-platinum. She has released a total of eight solo studio albums to date, with her most recent titled 24 Karat Gold: Songs from the Vault, released in October 2014. During her solo career, she has had a close working relationship with Tom Petty and the Heartbreakers. They served as a backing band for several tracks on each of her solo albums, and the two have toured and performed together frequently over the past three decades. The song "Stop Draggin' My Heart Around", performed by Nicks and Petty, was one of the biggest hits for either artist. Nicks was born at Good Samaritan Hospital in Phoenix, Arizona, to Jess Nicks (July 2, 1925 – August 10, 2005), former president of Greyhound's Armour-Dial, and Barbara Nicks (November 12, 1927 – December 29, 2011), a homemaker. Nicks's grandfather, Aaron Jess "A.J." Nicks, Sr. (May 18, 1892 – August 1, 1974), a struggling country music singer, taught Nicks to sing duets with him by the time she was four years old. Nicks's mother was so protective that she kept her at home "more than most people" and during that time fostered in her daughter a love of fairy tales. The infant Stephanie could pronounce her own name only as "tee-dee," which led to her nickname of "Stevie". Her father's frequent relocation as a food business executive had the family living in Phoenix, Albuquerque, El Paso, Salt Lake City, Los Angeles, and San Francisco during Nicks's youth. With the Goya guitar that she received for her 16th birthday, Nicks wrote her first song, "I've Loved and I've Lost, and I'm Sad But Not Blue". She spent her adolescence playing records constantly, and lived in her "own little musical world." While attending Arcadia High School in Arcadia, California, she joined her first band, the Changing Times, a folk rock group focused on vocal harmonies. Nicks first met her future musical and romantic partner, Lindsey Buckingham, during her senior year at Menlo-Atherton High School. When she saw Buckingham playing "California Dreamin'" at Young Life club, she joined him in harmony. She later recalled, "I was a senior in high school and Lindsey was a junior. And we went to a Young Life meeting ~ which was a religious meeting that simply got you out of the house on Wednesday nights ~ and um, he was there and I was there and we sat down and played California Dreaming. I thought he was a darling. I didn't see him again for two years and he called me up and asked if I wanted to be in a band... And so, I was in this band with him for three and a half years ~ a band called Fritz." Buckingham was in a psychedelic rock band named Fritz, but two of its musicians were leaving for college. He asked Nicks in mid-1967 to replace the lead singer, a guitarist named Jody Moreing. For the next three years, Fritz comprised Nicks on lead vocals, Buckingham on bass and vocals, Brian Kane on lead guitar, Javier Pacheco on keyboards, and Bob Aguirre on drums. Pacheco was the main songwriter in the group, with a psychedelic bent, but Nicks's own compositions brought a country rock flair to the group. Fritz became popular as a live act when it opened for both Jimi Hendrix and Janis Joplin from 1968 until 1971. Nicks credits each of those acts as having inspired her own stage intensity and performance. Both Nicks and Buckingham attended San Jose State University in Northern California, where Nicks majored in speech communication, and planned to become an English teacher. Nicks dropped out of college the semester before graduation. After Fritz disbanded in 1972, Nicks and Buckingham continued to write as a duo, recording demo tapes at night in Daly City on a one-inch, four-track Ampex tape machine Buckingham kept at the coffee roasting plant belonging to his father, Morris. They then secured a deal with Polydor Records, which used tracks from their demo tapes to release the album Buckingham Nicks in 1973. The album was not a commercial success, despite the live shows that Nicks and Buckingham performed together to support it, and Polydor dropped the pair from the label. To support herself and Buckingham, who wrote music while recovering from mononucleosis, Nicks worked a variety of jobs, which included waiting tables and a stint cleaning engineer/producer Keith Olsen's house, where Nicks and Buckingham lived for a time before moving in with Richard Dashut. Nicks says that she first used cocaine during this time. "We were told that it was recreational and that it was not dangerous," Nicks recalled to Chris Isaak in 2009. "I realized then that everything could tumble, and when you're in Colorado, and you're surrounded by these incredible mountains, you think 'avalanche'. It meant the whole world could tumble around us and the landslide would bring you down." "Everybody seems to think that I wrote this song about them ... and my dad, my dad did have something to do with it, but he absolutely thinks that he was the whole complete reason it was ever written. I guess it was about September 1974, I was home at my dad and mom's house in Phoenix, and my father said, 'You know, I think that maybe ... you really put a lot of time into this [her singing career], maybe you should give this six more months, and if you want to go back to school, we'll pay for it ... Lindsey and I went up to Aspen, and we went to somebody's incredible house, and they had a piano, and I had my guitar with me, and I went into their living room, looking out over the incredible, like, Aspen sky way, and I wrote "Landslide" ... three months later, Mick Fleetwood called." Nicks and Buckingham joined Fleetwood Mac in January 1975, six weeks after Keith Olsen played their track "Frozen Love" for drummer Mick Fleetwood, who had come to Sound City in California, in search of a studio to record Fleetwood Mac's next album. Fleetwood remembered Buckingham's guitar work when guitarist Bob Welch departed to pursue a solo career. On December 31, 1974, Fleetwood called Buckingham to ask him to replace Welch as guitarist, but Buckingham insisted that Nicks and he were "a package deal." A few days later, Nicks and Buckingham discussed the offer over dinner with Fleetwood and the McVies, and the feeling was mutual that incorporating the Buckingham–Nicks pair would improve Fleetwood Mac, making the British band into an Anglo-American one. The first rehearsals confirmed this feeling, with the harmonies of the newcomers adding a pop accessibility to the hard rock. Despite this development, the duo of Buckingham-Nicks was called to perform three sold-out dates in Birmingham, Alabama – the one area in which their album had seen success. During these final performances as Buckingham-Nicks, Nicks and Buckingham told their fans that they had just joined Fleetwood Mac. In 1975, the band achieved worldwide success with the album Fleetwood Mac. 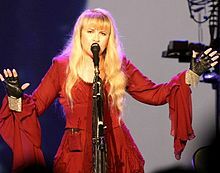 Nicks' "Rhiannon", which appeared on the album, was eventually voted as one of The 500 Greatest Songs of All Time by Rolling Stone. Her live performances of the song throughout the decade began to take on a theatrical intensity not present on the album's single. The song built to a climax in which Nicks' vocals were so impassioned that Mick Fleetwood declared, "her 'Rhiannon' in those days was like an exorcism." Also included on the album was "Landslide", which achieved collected millionaire status with over three million airplays and spawned multiple cover versions. Also in 1975, Nicks worked with clothing designer Margi Kent to develop Nicks's unique onstage look, with costumes that featured flowing skirts, shawls, and platform boots. Following the success of Fleetwood Mac, increasing tension between Nicks and Buckingham began to take its toll on their creativity, and Nicks ended the relationship. Fleetwood Mac began recording their follow-up album, Rumours, in early 1976 and continued until late in the year. Also, Nicks and Buckingham sang back-up on Warren Zevon's self-titled second album. Among Nicks's contributions to Rumours was "Dreams", which became the band's only Billboard Hot 100 number-one hit single to date. Nicks had also written and recorded the song "Silver Springs", but it was ultimately not included on the album because the early versions of the song ran too long, the album was getting to be longer than the producer's target of 22 minutes per side, and the band was also concerned that the album had too many slow songs. Instead, the shorter and faster Nicks-penned tune "I Don't Want to Know" was recorded in its place. Studio engineer and co-producer Ken Caillat said that Nicks was very unhappy to find that the band had decided against her song "Silver Springs", which he said was beautifully crafted, and carried some of the band's best guitar work. Despite being devastated by the bad news, Nicks quickly laid down her vocal tracks for "I Don't Want to Know". Nicks' song "Silver Springs" was written about her relationship with Buckingham, and it was released as a B-side of the "Go Your Own Way" single—Buckingham's song about Nicks. Copies of the single eventually became collectors' items among fans of Fleetwood Mac. "Silver Springs" was included on the four-disc Fleetwood Mac retrospective 25 Years – The Chain in 1992. In November 1977, after a New Zealand concert for the Rumours tour, Nicks and Fleetwood, who was married to Jenny Boyd, secretly began an affair. The pair mutually decided to end the affair. "Never in a million years could you have told me that would happen," Nicks has stated. "Everybody was angry, because Mick was married to a wonderful girl and had two wonderful children. I was horrified. I loved these people. I loved his family. So it couldn't possibly work out. And it didn't. I just couldn't." She has also stated that had the affair progressed, it "would have been the end of Fleetwood Mac". Soon after, in October 1978, Mick Fleetwood left his wife for Nicks' best friend Sara Recor. After the success of the Rumours album and tour in 1977 to 1978, Fleetwood Mac began recording their third album with Buckingham and Nicks, Tusk, in the spring of 1978. That year, Nicks sang back-up on virtually every track of Not Shy, recorded by musician Walter Egan, a friend of both Nicks and Buckingham. One track, "Magnet and Steel", inspired by Nicks, prominently featured her on back-up vocals and became a hit single on the Billboard Hot 100 chart during the summer of 1978. Lindsey Buckingham also produced the album, and played guitar and provided backing vocals on some of the tracks. By 1978, Nicks had amassed a large backlog of songs dating back to her Buckingham Nicks days that she had been unable to record and release with Fleetwood Mac because of the constraint of having to accommodate three songwriters on each album. Nicks wrote and recorded demos for a solo project during Tusk sessions in 1979 and the Tusk world tour of 1979–80. Nicks, Danny Goldberg, and Paul Fishkin founded Modern Records to record and release Nicks's material. Nicks recorded the hit duets "Whenever I Call You Friend" with Kenny Loggins in 1978, and "Gold" with John Stewart in 1979. Fleetwood Mac's Tusk was released on October 19, 1979. During 1981, Nicks made occasional guest appearances with Tom Petty and the Heartbreakers on their Hard Promises tour. Nicks' first solo album, Bella Donna, was released on July 27, 1981, to critical and commercial acclaim, reaching number one on the Billboard 200 chart, with four singles making the Billboard Hot 100, and Rolling Stone deeming her "the Reigning Queen of Rock and Roll". The day that Bella Donna reached number one on the Billboard 200, Nicks found out that her best friend Robin Anderson was diagnosed with leukemia. Robin gave birth to a son, appointing Nicks as the child's godmother. "I never got to enjoy Bella Donna at all because my friend was dying. Something went out that day; something left." Following Robin's death in 1982, Nicks married Robin's widower Kim Anderson, believing that her friend would want her to care for the baby. "We were all in such insane grief, just completely deranged," she told The Telegraph in 2007. The couple divorced eight months after the marriage. Bella Donna introduced Nicks' back-up singers, Sharon Celani and Lori Perry, who have contributed vocals to all of Nicks' solo albums since then. In November 1981, Nicks embarked on the White Winged Dove tour, which she had to cut short to record the Mirage album with Fleetwood Mac. Nicks toured with Fleetwood Mac for the Mirage tour in late 1982. Nicks released her second solo album, The Wild Heart, on June 10, 1983. The album went double platinum, reached number five on the Billboard 200 albums chart, and featured three hit singles. It also introduced songwriter and performer Sandy Stewart as co-writer and vocalist. Nicks performed at the second US Festival at Glen Helen Regional Park in San Bernardino, California, and later toured the US from June 1983 to November 1983. Nicks appeared on Saturday Night Live in December 1983, performing "Stand Back" and "Nightbird". Following the tour for The Wild Heart, Nicks commenced work on her third solo album. Originally titled Mirror Mirror, Nicks recorded songs for the album during 1984. However, Nicks was unhappy with the album, and opted to record a new batch of songs in 1985. Rock A Little, as it was retitled, was released November 18, 1985, to commercial success, supported by three successful singles. Nicks toured for Rock A Little in 1986. The tour ended on October 10, 1986. Nicks also performed with Bob Dylan and Tom Petty and the Heartbreakers during their tour in Australia. The tour marked a turning point in Nicks' life. The January before the tour was to begin, a plastic surgeon warned her of severe health problems if she did not stop using cocaine. "I said, 'What do you think about my nose? '," she recalled on The Chris Isaak Hour in 2009. "And he said, 'Well, I think the next time you do a hit of cocaine, you could drop dead.'" At the end of the Australian tour, Nicks checked herself into the Betty Ford Center for 30 days to overcome her cocaine addiction. Recalling the strong influence of Janis Joplin and Jimi Hendrix on her music and life, she told a UK interviewer, "I saw how they went down, and a part of me wanted to go down with them ... but then another part of me thought, I would be very sad if some 25-year-old lady rock and roll singer ten years from now said, 'I wish Stevie Nicks would have thought about it a little more.' That's kind of what stopped me and made me really look at the world through clear eyes." Later that year, on the advice of friends concerned that she might relapse, she visited a psychiatrist who prescribed the sedative Klonopin to help her remain free from cocaine. In late 1985, Fleetwood Mac began work on Tango in the Night, but due to her promotional schedule for the Rock A Little album and subsequent tour, Nicks was mostly unavailable to work on the album with the band except for a few weeks following her stay at the Betty Ford Center in 1986 (which was the inspiration for the song "Welcome To The Room...Sara"). She sent the band demos of her songs to work on in her absence. The album was released in April 1987 and became the band's second-highest selling album ever, behind Rumours. Creative differences and unresolved personal issues within the band led Buckingham to quit the group right before their world tour. According to bassist John McVie, a "physically ugly" confrontation between Nicks and Buckingham ensued when Nicks angrily challenged Buckingham's decision to leave the band. The band embarked on the Shake The Cage tour in September 1987, with Buckingham replaced by Rick Vito and Billy Burnette. The tour was suspended during Nicks' bout with chronic fatigue syndrome and developing addiction to Klonopin, though it resumed in 1988. Tango in the Night met with commercial success and was followed in 1988 by Fleetwood Mac's Greatest Hits album in November 1988. Also in 1988, Nicks began work on a fourth solo album with English record producer Rupert Hine. The Other Side of the Mirror was released on May 11, 1989, to commercial success. Nicks became romantically involved with Hine. Nicks toured the US and Europe from August to November 1989, the only time she has toured Europe as a solo act. She has famously been quoted since as stating that she has "no memory of this tour" due to her increasing dependency on Klonopin, prescribed in ever increasing amounts by a psychiatrist between 1987 and 1994, in an attempt to keep Nicks from regressing to her former abuse of cocaine. In 1989, Nicks set to work with Fleetwood Mac on a new album, Behind the Mask, which was released in 1990 to moderate commercial success in the US. In the UK, however, the album entered the chart at number one and was certified platinum. The band went on a world tour to promote the album, on the last night of which Buckingham and Nicks reunited on stage to perform "Landslide". After the tour concluded, Nicks left the group over a dispute with Mick Fleetwood, who would not allow her to release the 1977 track "Silver Springs" on her album Timespace: The Best of Stevie Nicks, because of his plans to save it for release on a forthcoming Fleetwood Mac box set. Fleetwood knew that the song would be valuable as a selling point for the box set, since over the years, it had gained interest among the band's fans. On the 10th anniversary of her solo career debut, Nicks released Timespace: The Best of Stevie Nicks on September 3, 1991. The following year, Fleetwood Mac also released a four-disc box set, 25 Years – The Chain, which included "Silver Springs". During the 1992 US presidential campaign, Bill Clinton used the Fleetwood Mac hit "Don't Stop" as his campaign theme song, and Nicks rejoined the classic Rumours line-up of the band (including Buckingham) to perform the song at Clinton's 1993 inaugural gala. No plans for an official reunion were made at that time. Nicks was criticized for her weight gain. Nicks, who is 5 feet 1 inch (1.55 m), had gained weight, peaking at 175 lb (79.4 kg). "Klonopin was worse than the cocaine," she has said. "I lost those 8 years of my life. I didn't write, and I had gained so much weight." In late 1993, while Nicks held a baby shower at her house, she tripped over a box, passed out, and cut her forehead near a fireplace. "I'm one of those people who doesn't injure themselves. I was horrified to see that blood. I hadn't had enough wine. I knew it was the Klonopin," she said, realizing that she needed help, and endured a painful 47-day detox in a hospital. Following her successful detox, Nicks released her fifth solo album, Street Angel, recorded during 1992 and 1993 using material written mostly in previous years. Released on May 23, 1994, Street Angel was poorly received, reaching number 45 on the Billboard Top 200. Nicks has since expressed major disappointment with the album, claiming that a lot of its production work took place during her second stint in rehab, meaning she had little or no say over the final product. Despite a three-month tour in support of the album, Nicks was crushed by the focus on her weight and the poor reception of the album. Disgusted by the criticism she received during the tour for being overweight, she vowed to never set foot on a stage again unless she slimmed down. In 1996, Nicks reunited with Lindsey Buckingham and contributed the duet "Twisted" to the Twister movie soundtrack, while in 1996, the Sheryl Crow-penned "Somebody Stand by Me" featured on the Boys on the Side soundtrack, and Nicks also remade Tom Petty's "Free Fallin'" for Fox's TV hit Party of Five. In 1996, Lindsey Buckingham, working on a planned solo album, enlisted the help of Mick Fleetwood and John McVie, which eventually led to a reunion of the entire band. A newly invigorated and slimmed-down Nicks joined Fleetwood Mac for The Dance, a highly successful 1997 tour that coincided with the 20th anniversary of the release of Rumours. Prior to the tour, Nicks started work with a voice coach, to lend her voice more control and protect it from the stress of lengthy touring schedules. She also went on a diet and started jogging to lose weight. The live CD release, The Dance, was released to commercial and critical acclaim, earning the group several Grammy nominations, including their live performance of Nicks' "Silver Springs". In 1998, she joined the group for its induction into the Rock and Roll Hall of Fame. That same year, Fleetwood Mac was awarded the Outstanding Contribution at the BRIT Awards. She put work on a new solo album on hold when she was approached by Warner Music to release a solo career-spanning box set, to finish her contract with Atlantic Records in the US. After the culmination of the Fleetwood Mac reunion tour, Nicks settled down in Los Angeles and Phoenix with close friends and colleagues to devise a track list for this three-disc collection. The box set Enchanted was released to acclaim on April 28, 1998, with liner notes from Nicks, as well as exclusive rare photographs, and pages from her journals. Nicks supported the box set with a successful US tour. In 1998, Nicks contributed to the Practical Magic soundtrack and performed in Don Henley's benefit concert for the Walden Woods Project. Nicks had begun writing actively for Trouble in Shangri-La in 1994 and 1995 as she came out of her Klonopin dependency. According to her, friend and former musical partner Tom Petty was responsible for convincing her to write music again when he rebuffed her request that he write a song with her. She resumed recording songs for the Trouble in Shangri-La album with Sheryl Crow, who produced and performed on several tracks. When a scheduling conflict forced Crow to drop out of the project, Nicks first approached R&B producer Dallas Austin, but these sessions have never surfaced. Nicks finally called on John Shanks to produce the remainder of the album, with additional contributions from David Kahne, Rick Nowels, Pierre Marchand, and Jeff Trott. Artists Natalie Maines, Sarah McLachlan, and Macy Gray contributed to some of the tracks. Released May 1, 2001, Trouble in Shangri-La restored Nicks's solo career to critical and commercial success. "Planets of the Universe" was nominated for a Grammy Award for Best Female Rock Vocal Performance, and Nicks was named VH1's "Artist of the Month" for May 2001. Nicks was named one of People magazine's 50 Most Beautiful People, was featured in a well-received Behind the Music episode, and performed an episode of the VH1 Storytellers Concert Program. Nicks made several television appearances in support of the album and performed at the 2001 Radio Music Awards. Nicks supported the album with a successful tour, although some shows were canceled or postponed because of her bout with acute bronchitis. Shows were also canceled because of the September 11 attacks in the U.S. In 2001, Fleetwood Mac began work on a new studio album, though this time without Christine McVie, leaving Nicks as the sole woman in the band for the first time. After the end of her solo tour, Nicks convened with the other members of the band for recording during 2002. Say You Will was released in April 2003 and met with commercial success but mixed reviews. Nicks joined the group to support the album with a world tour lasting until September 2004. She has subsequently stated in several interviews that she was not happy with the album or the successful world tour that followed, citing production disputes with Buckingham as a core factor, as well as the absence of fellow female band member Christine McVie. A documentary of the making of the album, Destiny Rules, was released on DVD in 2004 and chronicles the sometimes-turbulent relationships between band members, especially Buckingham and Nicks, during that time in the studio. After a few months' respite from the Say You Will tour, Nicks did a four-night stint in May 2005 at Caesars Palace in Las Vegas, and then did 10 shows with Don Henley dubbed the Two Voices tour. During the summer of 2005, Nicks continued doing solo shows (Gold Dust tour) with pop singer Vanessa Carlton as the opening act, playing over 20 dates nationwide. On March 27, 2007, Reprise Records released Crystal Visions – The Very Best of Stevie Nicks in the US. The album debuted at number 21 on the Billboard 200 albums chart. The album has sold over 505,000 copies in the U.S. The compilation includes her hit singles, a dance remix, and one new track, a live version of Led Zeppelin's "Rock and Roll". Two versions of this album were made, one with just the audio CD and a deluxe version which includes a DVD featuring all of Nicks' music videos with audio commentary from Nicks herself, as well as rare footage from the Bella Donna recording sessions. A tour with Chris Isaak, opening in Concord, California on May 17, 2007, supported the release. Reprise Records initially released two radio-only promos, the live version of "Landslide" with the Melbourne Symphony Orchestra and "Rock and Roll". Both tracks failed to garner much airplay and made no impact on the charts. Reprise Records released "Stand Back" (issued with club mixes) on May 29, 2007. "Stand Back", which peaked at number five on the pop singles chart in 1983, reached number two on the Billboard Club chart. Nicks previously reached number one on this chart, with "Planets of the Universe" (from Trouble in Shangri-La) in 2001. The remix single of "Stand Back" debuted on the Billboard Hot Singles Sales chart on September 15, 2007, at number 10, peaking at number four the following week. It also debuted on the Billboard Hot Dance Singles Sales chart at number three, later peaking at number one . On March 31, 2009, Nicks released the album, The Soundstage Sessions, via Reprise Records. The album debuted at number 47 on the Billboard 200 albums chart. The first single from the album, "Crash into Me", was released as a digital download, along with "Landslide" (orchestra version) as a B-side, on March 17, 2009. In late 2008, Fleetwood Mac announced that the band would tour in 2009, beginning in March. As per the 2003–04 tour, Christine McVie would not be featured in the line-up. The tour was branded as a 'greatest hits' show titled "Unleashed", although they played album tracks such as "Storms" and "I Know I'm Not Wrong". After completing the Unleashed tour with Fleetwood Mac, Nicks began work on her first solo album in a decade with David A. Stewart, a musician and record producer best known for being one half of the duo Eurythmics. Nicks performed in a series of shows in August 2010 ("it's not really a tour", she said). They did not contain any of her new music, because she did not want it to end up on YouTube. The Santa Barbara show benefited a young girl she had met through the Make-a-Wish Foundation in Los Angeles with rhabdomyosarcoma, a rare cancer. On January 13, 2011, Reprise announced Nicks' upcoming album In Your Dreams would be released on May 3, and the lead single, "Secret Love", would be released on February 8. Reprise provided a free download of the single to fans who ordered the album via certain websites. Nicks originally wrote "Secret Love" in 1976 and recorded a demo of it for Fleetwood Mac's 1977 album, Rumours. It did not make the final cut for the album. The demo version had been circulating among fans for many years prior to its inclusion on In Your Dreams. Nicks promoted the song with a video directed by Dave Stewart. Nicks' goddaughter Kelly appears in the video wearing a vintage dress that Nicks wore on stage in 1976. According to Nicks, Kelly portrays the young Stevie Nicks blending with the soul of Nicks' 62-year-old self. On the US Billboard charts, "Secret Love" was a modest hit on the Adult Contemporary Singles chart, peaking at number 20, and at number 25 on the Triple-A Singles chart. Another song on the album, "For What It's Worth", features Nicks' niece in the video. The song reached number 25 on the Billboard Adult Contemporary chart in September 2011. A documentary film was made for the album, directed by Stewart. The documentary was critically acclaimed, and Nicks appeared at many film festivals to support the documentary. Nicks promoted the album with appearances on various television shows, including The Tonight Show with Jay Leno, The X Factor, The Talk, Good Morning America, The Ellen DeGeneres Show, The Oprah Winfrey Show. and Dancing with the Stars. In Your Dreams was well received by music critics. Rolling Stone commented "It's not just her first album in 10 years, it's her finest collection of songs since the Eighties". The album debuted at number six on the Billboard 200, giving Nicks her fifth top-10 album on that chart, with 52,000 copies sold in the first week. Elsewhere, the album has made numerous top-50 debuts, including number 24 on the Australian ARIA chart, number 22 in Canada, and number 14 in the UK. The same day that Nicks' new album was released, Fox Network broadcast the Glee episode (Season 2, Episode 19) "Rumours" that featured six songs from Fleetwood Mac's 1977 album, including Nicks' song "Dreams" (the band's only number-one song on the US charts). The show sparked renewed interest in the band and its most commercially successful album, and Rumours re-entered the Billboard 200 chart at number 11, the same week that In Your Dreams debuted at number six. (Nicks was quoted by Billboard saying that her new album was "my own little Rumours."). Nicks contributed a cover of Buddy Holly's "Not Fade Away" for the tribute album Listen to Me: Buddy Holly, which was released in September 2011. On March 29, 2012, Nicks made a guest appearance as herself on the NBC sitcom Up All Night. The show featured an excerpt of the 1981 track "Sleeping Angel", as well as new duets with both Maya Rudolph and Christina Applegate of "Whenever I Call You Friend" and "Edge of Seventeen". Rudolph and Applegate have said they are fans of the singer. On December 14, 2012, it was announced that Nicks would be featured on an original track done in collaboration with Dave Grohl for his Sound City soundtrack, alongside other artists. In 2013, Fleetwood Mac toured again as a four-piece band throughout North America and Europe. On April 30, the band released their first new studio material since 2003's Say You Will via digital download on iTunes with the four-track EP, "Extended Play" containing three new songs and one new song from the Buckingham Nicks sessions ("Without You"). On December 3, 2013, Nicks released the In your Dreams documentary film on DVD. The DVD debuted at number seven on the Billboard Top Music Video sales chart and number 29 on the UK Music Video Top 40 chart. In 2014, Nicks appeared on the third season of television series American Horror Story titled "Coven". She played a fictional version of herself, portraying a "white witch" with supernatural powers in two episodes. On the show, she performed the songs "Rhiannon", "Has Anyone Ever Written Anything For You? ", and "Seven Wonders". "I said, 'That's perfect,'" she told Us in response to the show's music request. "Because that's exactly how I like to affect people. I want people to put my songs on because they are unhappy and need a boost to dance around their apartment a little and feel good. That's why I write. 'Of course you can use my music. Take it!'" In May 2014, Nicks was honored with a BMI Icon Award. In July 2014, it was announced that Nicks would join The Voice as the adviser for Adam Levine's team. In September 2014, Nicks released her eighth studio album, 24 Karat Gold: Songs from the Vault which reached number seven on the Billboard 200. She also began a North American tour with Fleetwood Mac, now reunited with Christine McVie, the On with the Show tour. In May 2015, Nicks reissued Crystal Visions – The Very Best of Stevie Nicks on "crystal clear" transparent double vinyl. The vinyl came with a vinyl messenger bag and a limited-edition lithograph. Stevie Nicks toured with The Pretenders in 2016 and 2017. On April 26, 2017, Pitchfork revealed that Nicks would be featured on a track from American singer Lana Del Rey's upcoming fifth studio album, Lust for Life, which is set for a 2017 release. Standing at 5 feet 1 inch (1.55 m), Nicks has stated she felt "a little ridiculous" standing next to Mick Fleetwood, who is 6 feet 6 inches (1.98 m). For this reason, she developed a penchant for 6-inch (15 cm) platform boots. "Even when platforms went completely out of style, I kept wearing them because I didn't want to go back to being 5 feet 3 inches (1.60 m) in heels", she told Allure in 1995. Over the years, Nicks has developed a style which she calls her "uniform". Nicks has started a charity foundation titled "Stevie Nicks' Band of Soldiers" which is used for the benefit of wounded military personnel. I call it a soldiers' iPod. It has all the crazy stuff that I listen to, and my collections I've been making since the '70s for going on the road, when I'm sick ... or the couple of times in my life that I have really been down, music is what always dances me out of bed. — Stevie Nicks, The Arizona Republic. So, as Mick [Fleetwood] and I went from room to room delivering their tiny iPod, they told us their stories. Mick became his tall, loving, father figure, English self, taking in every word they said, remaining calm (at least on the outside) inspiring them. We floated from room to room down through the halls of the two hospitals over a three-day period. We gave out all our iPods. Right before I left for DC, Steven Tyler and Joe Perry dug into their pockets and came up with $10,000 for me. In my eyes they went from the coolest rock stars to generous great men; as my press agent Liz Rosenberg said, every returning wounded soldier should be given an iPod. It will be an integral part of their recovery. Nicks is not only a musical icon, but also recognized for her unique style. Her style has remained the same throughout her years in the spotlight and even "at 60 she is still working the gossamer tunics and shawls that have influenced two generations of Stevie acolytes, and given her performances the feel of a Wiccan ritual" writes New York Times reporter Ruth La Ferla. Nicks has been known for her multiple wardrobe changes during live performances, almost having a new outfit for each song she sang. Her unique look—including lots of chiffon hanging from her body—was part of her trademark look. The cost to keep up her overall style, of hair, makeup, and wardrobe, did not come cheap. Nicks filed tax deductible expenses in 1991 costing "$12,495 for makeup and hairstyling $43,291 for professional clothing and maintenance" alone. Many singers – among them Echosmith, Courtney Love, Michelle Branch, Belinda Carlisle, the Dixie Chicks, Mary J. Blige, Sheryl Crow, Nadia Ali, Florence Welch, Taylor Swift, Vanessa Carlton, and Delta Goodrem have cited Nicks as an inspiration. She has participated in duets or provided guest vocals for several of their albums, as have they on her albums. The Dixie Chicks covered her 1975 classic "Landslide", which became a top-10 hit (number one on the Adult Contemporary chart) and a number one hit on the Country chart. This cover also earned her a BMI Songwriters Award in 2003 when it won Song of the Year (the award is given to the songwriter of the track, regardless of the performer). According to BMI, "Landslide" also earned Nicks the 35th Robert J. Burton Award as "Most Performed Country Song of the Year". This distinction is given to the song tallying the most feature US broadcast performances during the eligibility period. Included on the Dixie Chicks' platinum Monument album Home, "Landslide" was a Country, Adult Top 40, Hot 100 and AC Billboard charts smash. Alternative rock band the Smashing Pumpkins made an acoustic cover of the song that was featured on their 1994 B-side collection Pisces Iscariot. The cover was also a hit and made it to the top three on the Modern Rock Tracks chart in the US that year. Other successful covers have included the Corrs' "Dreams" and Courtney Love's band Hole with "Gold Dust Woman". "Edge of Seventeen" was sampled on Destiny's Child's 2001 number one single "Bootylicious". Nicks appeared in the video for "Bootylicious" and in an episode of MTV's Making The Video that featured it, in which she expressed her admiration for both the song and the group. Also, American actress and singer Lindsay Lohan covered "Edge of Seventeen" on her second studio album A Little More Personal (Raw) (2005). Deep Dish fulfilled their "Dreams" of working with Nicks in 2005 when Nicks offered to re-record vocals on a remix of her number-one penned song, "Dreams". The Deep Dish version went on to reach number two on the Billboard Hot Dance Airplay chart, as well as providing Nicks with her third UK top-40 hit. Nicks provided additional vocals and writing on Vanessa Carlton's 2007 album, Heroes and Thieves. On January 31, 2010, Nicks performed with Taylor Swift at the 52nd Annual Grammy Awards. Swift, who describes Nicks as one of her childhood heroes, introduced her to the audience by saying, "It's a fairy tale and an honor to share the stage with Stevie Nicks." Nicks also recorded a duet of "Santa Claus is Coming to Town" with Chris Isaak on his 2004 Christmas album, Chris Isaak Christmas and sang with Isaak on his PBS Christmas television special. Nicks' only marriage was to Kim Anderson, the widower of her friend Robin Anderson. They married in 1983 soon after Robin Anderson died of leukemia and while the Bella Donna album was on the top of the charts. "I was determined to take care of [Robin's] baby, so I said to Kim, 'I don't know, I guess we should just get married." Nicks and Anderson divorced after only a few months: "We didn't get married because we were in love, we got married because we were grieving and it was the only way that we could feel like we were doing anything." Years after their divorce, she reunited with her stepson when he was a teenager, putting him through college, and she has maintained contact with him ever since. Nicks had been romantically linked to Lindsey Buckingham since 1968, briefly to Mick Fleetwood in 1977, Eagles drummer/vocalist Don Henley during the late 1970s, and briefly to Eagles songwriter J. D. Souther. She connected with Jimmy Iovine, who produced Bella Donna during 1980–81, and with Eagles guitarist Joe Walsh during 1983–86, whom she listed in 2007 as her greatest love, though the couple could not sustain the relationship because of mutual drug abuse. Nicks toured with Walsh in 1984, and wrote "Has Anyone Ever Written Anything for You?" about Walsh. Nicks has said that she consciously chose not to have children of her own, due to her demanding career and desire to follow her art wherever it should take her: "My mission maybe wasn't to be a mom and a wife; maybe my particular mission was to write songs to make moms and wives feel better." She finds maternal fulfillment through her niece, godchildren, and extended family: "I have lots of kids. It's much more fun to be the crazy auntie than it is to be the mom, anyway." Nicks has maintained a journal nearly every day since Fleetwood Mac began. "I like to tell all my fairy goddaughters and my niece that when I'm gone they can sit on the floor and go through all these journals, and they can walk through my life, and they can smell the gardenia perfume on the pages. They can have it in their hands, who I was." Regarding a book based on her life, she has said, "I wouldn't write a book unless I could really tell the truth, and say all the people are in it are represented right ... If I'm gonna talk about all the people in my life, I need to be old enough and so do they, that nobody's gonna care ... I would never write a book about the bad parts. I would mostly revel in the fantastic parts, of which there were so many." In early 2007, reports surfaced concerning Lindsay Lohan's interest in buying the rights to Nicks' life story and developing a motion picture in which she planned to play her. In March 2007, while promoting her album Crystal Visions, Nicks was asked about this rumor. She told Access Hollywood, "That is completely insane and crazy. There is no movie in the works on my life. Nobody can do a movie about my life without me being involved, because nobody knows what really happened in my life until I tell them. So, nobody can make a movie about my life. And if anybody ever went and made a movie about my life without my permission and my being involved, I would slam it so hard to the press that it would never do anything." In 2009, she told The New York Times about Lohan, "Over my dead body. She needs to stop doing drugs and get a grip. Then maybe we'll talk." Until July 2007, Nicks lived in Paradise Valley, Arizona, a suburb of Phoenix in a home she had built in 1981 and shared with her brother Chris, his wife Lori, and their daughter Jessica. She announced in mid-2007 that her Paradise Valley home would be put up for sale, citing her aspirations to "downsize" and focus more on her charity work, and the fact that in the last year she had only "spent about two weeks there". The house was put on the market for a reported $3.8 million and later sold for $3 million. Nicks became an ordained minister with the Universal Life Church World Headquarters of Florida and officiated the wedding of Deer Tick singer John McCauley and singer-songwriter Vanessa Carlton on December 27, 2013. In October 2005, Nicks attended the Melbourne Cup Week in Australia, and one of the horse-racing stakes was named after her: The Stevie Nicks Plate. She used this opportunity to launch her promotion of an Australian/New Zealand extension to her Gold Dust tour in February and March 2006. Nicks toured in Australia and New Zealand with popular Australian performer John Farnham. She also appeared in concert with Tom Petty in June near Manassas, Virginia, and at the Bonnaroo Music Festival that same month. In 2006, Nicks performed with Tom Petty and the Heartbreakers for the first leg of their tour in the summer, and later in the year returned as a guest performer for a number of songs on the tour celebrating Petty's 30th anniversary since his debut album. Tom Petty's Homecoming Concert in Gainesville, FL, which contained performances with Stevie Nicks, was filmed for PBS Soundstage as well as DVD release for March 2007. Nicks was also the featured performer for Bette Midler's benefit function, Hulaween, in October 2006. Beginning in May 2007, Nicks began touring with pop/rock artist Chris Isaak. The last Stevie Nicks/Chris Isaak show was June 17, 2007, at the Tweeter Center in Boston. Nicks continued the tour solo, with Vanessa Carlton opening on some dates. The tour finished at The Borgata in Atlantic City on August 24, 2007. In 2008, Nicks embarked on the Soundstage Sessions tour in the U.S. A video recording of one concert date was released in 2009: Live in Chicago. Vanessa Carlton performed as a guest artist. In 2009, Fleetwood Mac embarked on a global hits tour. The Unleashed tour took place in arenas on multiple continents. The tour ended in December with two sell-out shows of 35,000 people at the New Plymouth TSB Bowl of Brooklands in New Zealand. Rod Stewart and Nicks co-headlined The Heart and Soul tour. Launched March 20, 2011, in Fort Lauderdale, Florida, the tour united the two singers for a series of arena concerts throughout North America – with performances in New York, Toronto, Los Angeles, Philadelphia, Chicago, Detroit, Tampa, Montreal, and more. A solo tour for In Your Dreams began on August 9, 2011 in Denver, Colorado. Nicks announced on her July 27 appearance on America's Got Talent that Michael Grimm would be going on tour with her. She then continued on an Australian and New Zealand leg of the tour accompanied by Dave Stewart until December 2011. Nicks joined Rod Stewart in the summer of 2012 for another leg of the Heart and Soul tour, and resumed the In Your Dreams tour in June 2012. Nicks has been nominated for eight Grammy Awards as a solo artist, holding the record for most nominations for Best Female Rock Vocal without a win. Nicks has been nominated for nine competitive Grammy Awards as a member of Fleetwood Mac, winning the 1978 Grammy Award for Album of the Year for Rumours, and received the 2003 Grammy Hall of Fame Award. ^ "1981 Rolling Stone Covers: RS351: Stevie Nicks". Rolling Stone. September 3, 1981. Retrieved October 5, 2011. ^ "Stevie Nicks in LA Times". Rockalittle.com. October 23, 1997. Retrieved February 18, 2011. ^ "100 Greatest Songwriters of All Time". Rolling Stone. Retrieved December 2, 2016. ^ "100 Greatest Singers of All Time, No. 98, Stevie Nicks". Rolling Stone. Retrieved October 31, 2012. ^ "Grammy Nomintations ". Ledge. fleetwoodmac.net. June 16, 2008. Retrieved October 5, 2011. ^ a b c Daisann McLane (1980). "Five Not So Easy Pieces". Rolling Stone – Issue 310. Retrieved June 1, 2010. ^ a b Randy Cordova (October 21, 1997). "Oh, Mother! – Fleetwood Mac's Stevie, 49, still Barbara's little girl". Arizona Republic. Retrieved June 1, 2010. ^ "Stevie Nicks on her Family". inherownwords.com. Retrieved June 1, 2010. ^ Mike Ragogna (2012). "In Your Dreams Documentary Premieres at Hampton's: Chatting With Stevie Nicks". The Huffington Post. Retrieved July 8, 2013. ^ "Stevie Nicks Story pg2 - Arcadia High School ROCK Legends". www.arcadiaapaches.com. Retrieved November 11, 2016. ^ Fleetwood, Mick; Bozza, Anthony (2014). Play On: Now, Then and Fleetwood Mac. Hodder & Stoughton. p. 32. ISBN 9781444753264. She briefly had a band called Changing Times, but her musical journey didn't really begin until the family moved, yet again, to San Francisco. ^ "Queen of the Stoned Age". Q. May 2001. Retrieved June 1, 2010. ^ "Stevie Nicks on Lindsey Buckingham 1". www.inherownwords.com. Retrieved 2017-03-03. ^ "Javier Pacheco Question and Answer Session". fleetwoodmac.net. July 5–24, 1999. Retrieved June 2, 2010. ^ "Stevie Nicks Biography". fleetwoodmac.net. Retrieved June 2, 2010. ^ a b "Stevie Nicks – Ask Stevie". Rock A Little. Retrieved February 11, 2016. ^ Fred Schruers (October 30, 1997). "Back on the Chain Gang". Rolling Stone. Retrieved June 2, 2010. ^ Jackson, Blair (February 1, 2011). "Music: Lindsey Buckingham in Two Worlds". Mix. ^ "Stevie Nicks – Behind the Music". nicksfix.com. Retrieved June 2, 2010. ^ Cynthia McFadden (September 7, 2010). "Stevie Nicks in Her Own Words". ABC News. Archived from the original on January 30, 2011. Retrieved September 1, 2014. ^ "The Chris Isaak Hour: Stevie Nicks 2009". Retrieved September 1, 2014. ^ "Stevie Nicks on 'Landslide'". inherownwords.com. Retrieved June 2, 2010. ^ "Stevie Nicks Tells the Story Behind 'Landslide'". performingsongwriter.com. Retrieved February 3, 2014. ^ Furman, Leah (2003). Rumours Exposed: The Unauthorized Biography of Fleetwood Mac. Citadel Press. pp. 80–81. ISBN 978-0-8065-2472-6. ^ "500 Greatest Songs of All Time". Rolling Stone. Retrieved September 30, 2012. ^ "Stevie Nicks – Behind the Music". Retrieved September 30, 2012. ^ "Stevie Nicks Wins in a 'Landslide' at BMI Country Awards; Steele Named Songwriter of the Year". November 3, 2002. Retrieved September 30, 2012. ^ Booth Moore (October 23, 1997). "Airy Godmother". Los Angeles Times. Retrieved June 2, 2010. ^ Marilyn Dennis (May 6, 2001). "Stevie Nicks Interview". CHUM Radio in Toronto. Retrieved June 2, 2010. ^ "Stevie Nicks on Lindsey Buckingham". inherownwords.com. Retrieved June 2, 2010. ^ "Fleetwood Mac – Rumours". timepieces.nl. Retrieved June 2, 2010. ^ Rooksby, Rikky (2004). Fleetwood Mac: The Complete Guide to their Music (2 ed.). Omnibus Press. p. 59. ISBN 1-84449-427-6. Retrieved June 2, 2010. ^ a b Caillat, Ken; Stiefel, Steve (2012). Making Rumours the inside story of the classic Fleetwood Mac album. Hoboken, N.J.: John Wiley & Sons. pp. 292–294. ISBN 978-1-118-28286-1. Retrieved September 1, 2014. ^ "Stevie Nicks Interview – Off The Record". nicksfix.com. Retrieved June 2, 2010. ^ "Fleetwood Mac Timeline for the 1970s". fleetwoodmac-uk.com. Retrieved June 3, 2010. ^ "UnCut Magazine – Five Go Mad". Retrieved October 14, 2012. ^ "Fleetwood Mac – The Rumour Mill, Classic Rock, June 2003". Google. February 15, 2004. Retrieved January 9, 2011. ^ Phil Sutcliffe (December 2003). "Take it to the Limit". Mojo. Retrieved June 3, 2010. ^ "The Penguin Q&A Sessions: Walter Egan, Section 2". FleetwoodMac.net. October 13–26, 1999. Retrieved January 17, 2015. ^ Kutner, Rick. "Walter Egan: Not Shy: Review". All-Music Guide. Retrieved January 18, 2015. ^ "The Penguin Q&A Sessions: Walter Egan, Section 1". FleetwoodMac.net. October 13–26, 1999. Retrieved January 17, 2015. ^ "Stevie Nicks – Behind the Music". Retrieved June 3, 2010. ^ "The Tuscaloosa News – Google News Archive Search". Google News. Retrieved October 6, 2014. ^ "High Times Magazine". Rockalittle.com. Retrieved October 6, 2014. ^ "roio". Bigozine2.com. Retrieved October 6, 2014. ^ "Pop: Tom Petty and Heartbreakers in Jersey". The New York Times. Retrieved October 7, 2014. ^ "Stevie Nicks on her Journal, Prose & Poetry". Inherownwords.com. Retrieved October 6, 2014. ^ "Bella Donna". AllMusic. Retrieved February 28, 2014. ^ a b "Stevie Nicks on Robin Snyder Anderson". inherownwords.com. Retrieved September 30, 2012. ^ "Stevie Nicks- A Survivor's Story". The Telegraph. Retrieved September 30, 2012. ^ "Stevie Nicks on the Girls: SharonCelani & Lori Perry-Nicks". Inherownwords.com. Retrieved October 6, 2014. ^ "Stevie Nicks – Behind the Music". Rockalittle.com. Retrieved October 6, 2014. ^ "Rock Concert: Fleetwood Maxc on 'Mirage' Tour". The New York Times. Retrieved October 7, 2014. ^ "Stevie Nicks on 'Rock A Little'". inherownwords.com. Retrieved June 2, 2010. ^ Brown, Mick (September 8, 2007). "Stevie Nicks: a survivor's story". The Daily Telegraph. London. Retrieved June 3, 2010. ^ a b "The Chris Isaak Hour: Stevie Nicks, 2009". ^ Cynthia McFadden (September 7, 2001). "Stevie Nicks in Her Own Words". ABC News. Retrieved June 3, 2010. ^ "Stevie Nicks, The Other Side of The Mirror, UK Interview". Retrieved October 14, 2012. ^ Marilyn Dennis (May 6, 2001). "Toronto Interview". CHUM Radio. Retrieved June 3, 2010. ^ Sykes, Graham. Rock Family Trees Transcript. ^ "Stevie Nicks on 'Rooms on Fire'". inherownwords.com. Retrieved June 2, 2010. ^ Steve Dougherty, Todd Gold (January 19, 1998). "High Priestess". People. ^ Steve Pond (February 7, 1991). "Fleetwood Mac, Live at the Great Western Forum, Inglewood, California December 7th, 1990". Rolling Stone. Retrieved June 3, 2010. ^ "Timeline 1990s". Go Your Own Way. Retrieved June 3, 2010. ^ "Timespace: The Best of Stevie Nicks by Stevie Nicks". MTV Artists. Retrieved October 6, 2014. ^ "Fleetwood Mac: 25 Years, The Chain 4 CD box set review". Louder Than War. Retrieved October 6, 2014. ^ Milk it! : collected musings on the ... – Google Books. Google Books. 2003. ISBN 0-306-81271-1. Retrieved January 9, 2011. ^ "Stevie Nicks – Goes her own way". US Weekly. Nicksfix.Com. June 11–18, 2001. Retrieved October 5, 2011. ^ "Stevie Nicks Talks To MSN Music". nicksfix.com. Nicksfix.Com. January 1999. Retrieved February 28, 2014. ^ Stepko, Barbara (May 25, 2001). "Stevie Wonder". nicksfix.com. nicksfix.com. Retrieved October 17, 2014. ^ "Whenever I Call You, Friend: Stevie Nicks' Greatest Collaborations " Radio.com". Radio.com. Retrieved October 6, 2014. ^ ""Party of Five" Soundtrack Due in '96". MTV News. Retrieved October 6, 2014. ^ "The Blue Letter Archives". Bla.fleetwoodmac.net. Retrieved October 6, 2014. ^ "Lakeland Ledger – Google News Archive Search". Google News. Retrieved October 6, 2014. ^ "Gold Dust Woman: A Q&A With Stevie Nicks". American Songwriter. Retrieved October 6, 2014. ^ "Stevie Nicks interview". Rockalittle.com. Retrieved October 6, 2014. ^ a b "Stevie Nicks: Rock Singer". People. Retrieved October 6, 2014. ^ "Silver Springs". Rock a Little. Retrieved February 28, 2014. ^ "Fleetwood Mac". Rockhall.com. Retrieved October 6, 2014. ^ "Fleetwood Mac". Brit Awards. Retrieved October 6, 2014. ^ "Stevie Nicks Interview on KLOS". Rockalittle.com. Retrieved October 6, 2014. ^ "The Blue Letter Archives". Bla.fleetwood.net. Retrieved October 6, 2014. ^ ""Crystal" Mesh Sheryl Crow and Stevie Nicks invite EW to their first recording session". Entertainment Weekly. Rockalittle.com. Retrieved October 6, 2014. ^ "Bjork, Joni Mitchell Reign Over Walden Woods Benefit". MTV News. Retrieved October 6, 2014. ^ "Stevie Nicks – Wall of Sound Interview". Rockalittle.com. Retrieved October 6, 2014. ^ "Stevie Nicks – Time Out New York Interview". Rockalittle.com. Retrieved October 6, 2014. ^ "Stevie Nicks". Billboard. February 12, 2001. Retrieved October 6, 2014. ^ "Dallas Austin Discusses Working With Stevie Nicks". MTV News. Retrieved October 6, 2014. ^ "Stevie Nicks – Mix 96.9 Interview". Rockalittle.com. Retrieved October 6, 2014. ^ "Complete List of Grammy Nominees". CBS News. January 4, 2002. Retrieved October 6, 2014. ^ "Stevie Nicks – PRNewswire". Rockalittle.com. Retrieved October 6, 2014. ^ "Ep. 043 – Stevie Nicks – Behind The Music – Episode Summary, Highlights, and Recaps". VH1. Retrieved October 6, 2014. ^ "Bronchitis Knocks Nicks Off Tour". Billboard. August 22, 2001. Retrieved October 6, 2014. ^ "Many Concerts Cancelled After 9/11 Attacks". Rolling Stone. Retrieved October 6, 2014. ^ "Reviews for Say You Will by Fleetwood Mac ". Metacritic. Retrieved October 6, 2014. ^ "Music Review: Fleetwood Mac – Say You Will". Blogcritics. Retrieved October 6, 2014. ^ Blackman, Guy (February 12, 2006). "A magical life – Music – Entertainment". The Age. Melbourne. Retrieved January 9, 2011. ^ "Pop DVD: Fleetwood Mac, Destiny Rules – Music". The Guardian. Retrieved October 6, 2014. ^ "The Blue Letter Archives". Bla.fleetwoodmac.net. Retrieved December 21, 2014. ^ "McGraw Leads Seven Top 10 Debuts Onto Billboard 200". Billboard. April 4, 2007. Retrieved October 6, 2014. ^ "Bella Donna -Bella Donna – Casino Connection Atlantic City". Casinoconnectionac.com. Retrieved October 6, 2014. ^ "Stevie Nicks To Join Chris Isaak on Tour". Paste. Retrieved October 6, 2014. ^ "Stevie Nicks Is Looking Back, Charging Forward on New Album". Santa Barbara Independent. July 26, 2010. Retrieved October 6, 2014. ^ "PrideSource – Stevie Nicks talks gays, 'Glee' controversy and losing weight ... with her own music?". Pridesource. Retrieved October 6, 2014. ^ "Chart Highlights: Rodney Atkins Takes 'Back Road' To No. 1 On Country Songs". Billboard. Retrieved August 9, 2013. ^ "Stevie Nicks Reveals Inspiration Behind For What It's Worth". CBS. Retrieved September 30, 2012. ^ "Stevie Nicks 'For What It's Worth' on 'Leno'". Rolling Stone. Retrieved October 6, 2014. ^ "Stevie Nicks on The X Factor". Tvtonight.com. Retrieved October 6, 2014. ^ "Stevie Nicks Discusses Her New Album and Performs on 'The Talk' (VIDEO)". The Huffington Post. Retrieved October 6, 2014. ^ "Stevie Nicks Performs in New York City " Q105". Myq105.cbslocal.com. Retrieved October 6, 2014. ^ "Rod Stewart and Stevie Nicks announce North American 'Heart and Soul' tour dates". ABC7 Los Angeles. Retrieved October 6, 2014. ^ "Legendary Ladies of Rock Perform on The Oprah Winfrey Show" WCBS-FM 101.1". Wcbsfm.cbslocal.com. Retrieved October 6, 2014. ^ "Show Tracker". Retrieved October 6, 2014. ^ "Beastie Boys Score No. 2 Debut on Billboard 200, Adele Holds at No. 1". Billboard. Retrieved August 9, 2013. ^ "ARIA Charts Media Release 2011" (PDF). ^ Semigran, Aly (May 4, 2011). "Fleetwood Mac Teach 'Glee' Kids A Lesson On Rumours". MTV. Retrieved August 29, 2011. ^ Graff, Gary. "Stevie Nicks Calls New Album 'My Own Little 'Rumours". Billboard. Retrieved August 29, 2011. ^ Caulfield, Keith. "Beastie Boys Score No. 2 Debut on Billboard 200, Adele Holds at No. 1". Billboard. Retrieved August 29, 2011. ^ "BUDDY HOLLY Has Great Company on Ganymede". Aliveandwellmovie.com. May 12, 2011. Archived from the original on September 3, 2011. Retrieved October 5, 2011. ^ "Participants " Listen to Me". True Great Original. Retrieved October 5, 2011. ^ "Nirvana/Paul McCartney collaboration to feature on Dave Grohl's 'Sound City' soundtrack". NME. December 14, 2012. Retrieved December 20, 2012. ^ "Fleetwood Mac Release 'Extended Play' EP". Rolling Stone. April 30, 2013. Retrieved March 1, 2015. ^ "Stevie Nicks Talks 'American Horror Story'". Rolling Stone. December 3, 2013. Retrieved December 21, 2013. ^ a b c Drew, Ian (January 8, 2014). "Stevie Nicks Talks 'American Horror Story'". Us Weekly. Retrieved February 28, 2014. ^ Seikaly, Andrew (May 14, 2014). "Stevie Nicks Honored by Adam Levine, Shakira, Sheryl Crow at BMI Pop Awards". The Hollywood Reporter. Retrieved August 6, 2014. ^ "Stevie Nicks joins 'The Voice'". CNN. July 10, 2014. Retrieved August 6, 2014. ^ "About | Stevie Nicks". www.stevienicksofficial.com. Retrieved 2017-04-18. ^ Pre-Order LIMITED EDITION "Crystal Visions…The Very Best of Stevie Nicks " Double Vinyl. Fleetwood Mac News (April 23, 2015). Retrieved on September 28, 2015. ^ Interview by Liz Derringer, High Times magazine – March 1982. ^ "How I Got That Look", Allure magazine, April 1995 Interview. ^ Transcribed by Jane Fijal, "Spotlight on Stevie Nicks", Aired on 96.1 WSRS Worcester, Massachusetts on August 5, 2001. ^ On someone who influenced her look, Glamour, December 1981. ^ "Review: Fleetwood Mac at American Airlines Center". Preston Jones. December 15, 2014. ^ Joseph Rosenfeld (May 16–22, 2007). "Stevie Nicks: Style Icon". metroactive.com. Archived from the original on October 5, 2007. Retrieved June 3, 2010. ^ a b c "Stevie's Journal Entries Regarding Visits to the Injured Troops". The Nicks Fix. Retrieved June 3, 2010. ^ "Still Dressing for Stevie". New York Times. Retrieved July 20, 2015. ^ "Tax Treatment of Leisure Accoutrements". American Bar Association. Retrieved July 20, 2015. ^ a b "Blonde On Blonde". Spin. Rockalittle.com. Retrieved February 1, 2014. ^ "The Popdose Interview: Belinda Carlisle". Popdose. Retrieved February 1, 2014. ^ "Stevie Nicks – CMT Interview with Dixie Chicks". Rockalittle.com. Retrieved February 1, 2014. ^ "iio – Bio – Nadia Ali". People.uleth.ca. August 3, 1980. Retrieved February 28, 2014. ^ Hodge, Will. (April 25, 2011) Rolling Stone Best of Rock 2011. Rollingstone.com. Retrieved on September 28, 2015. ^ Magowan, Margot (February 13, 2012). "Taylor Swift sings her way from victim to hero, triumphs at Grammys – City Brights: Margot Magowan". San Francisco Chronicle. Retrieved February 28, 2014. ^ kater. "Vanessa Carlton Is Like BFF with Stevie Nicks". Idolator. Retrieved February 28, 2014. ^ "Just friends". Cosmopolitan. May 6, 2013. Retrieved February 28, 2014. ^ "Stevie Nicks Wins in a 'Landslide' at BMI Country Awards". Broadcast Music Incorporated. November 3, 2003. Retrieved June 3, 2010. ^ Ditzian, Eric (January 31, 2010). "Taylor Swift Shares The Stage With Stevie Nicks at the Grammys". MTV. Retrieved January 9, 2011. ^ Stephanie Tuck (March 2002). "Desert Rose". In Style. Retrieved June 3, 2010. ^ a b ""Stevie Nicks: A Survivor's Story", By Mick Brown, September 8, 2007.". The Daily Telegraph. Retrieved July 4, 2014. ^ "Stevie Nicks: A Magical Life, 2006". The Age. Retrieved February 28, 2014. ^ Holly-George Warren. "Stevie Nicks on Loss, Love, and What She Wears". More. Retrieved February 3, 2014. ^ "Stevie Nicks interview — Access Hollywood". YouTube. Retrieved October 17, 2014. ^ "Stevie Nicks Tells Lindsay Lohan To 'Stand Back' About Playing Her in Movie". omg! news on Yahoo!. April 10, 2009. Retrieved June 3, 2010. ^ "Stevie Nicks: Lindsay Lohan will 'never' get to play me in a movie 'unless she cleans up her life'". Daily News. New York. March 6, 2011. Retrieved September 17, 2011. ^ "The Insider: Stevie Nicks sells home in Paradise Valley". Phoenix Business Journal. January 2008. Retrieved September 16, 2013. ^ Madeleine Davies. "Queen Witch Stevie Nicks Officiated a Wedding This Weekend". jezebel.com. Retrieved December 30, 2013. ^ By Sharon Krum, Women's Weekly, December 2005. ^ "The 2006 Stevie Shows". fmlegacy.com. Archived from the original on May 10, 2009. Retrieved June 3, 2010. ^ Liz Smith, 'HULAWEEN' SUCCESS – New York Post, November 2, 2006. ^ "Rod Stewart & Stevie Nicks Announce The Heart & Soul 2011 North American Tour".